Friday night. Dance rehearsals. Finally, dinner time. We decided to head to the Winking Lizard, or as my husband calls it, “the Lizard”. When we walked in to meet Mark and Andrew, who went ahead of the rest of us to get a table, Al immediately launched into a meltdown. It’s late; he’s tired and hungry. When we made it to the table, I noticed the people at the adjacent table snickering and whispering as they steal glances at my kid. Although I have no proof that they were truly talking about Al, I may have shot a look over at them to let them know I was watching. I do that. Knee jerk reaction, I guess. They saw the look, so I thought we were set. I then noticed the table of foul mouthed guys sitting behind us. I don’t so much mind the constant stream of f-words, but when one of them started to drop the r-word, I must have had an obvious reaction. Lucky save. I am in no mood to let that one go. Right now they are slinging chauvinistic comments and I can feel my ears steaming. Ugh. Hopefully the food is good tonight. I’ve lost patience with everything else. Seriously, school hasn’t even been out a full week yet, and I’m already dealing with this crap. Transitions are just the worst. Any parent of a child with special needs will wholeheartedly agree with that, and I suspect that a lot of other parents would concur. A change in the schedule brings about an array of difficult behaviors. It just takes one of the kids to start a chain reaction; when one acts out, they all jump on the Let’s-Make-Mom’s-Head-Explode bandwagon. By the time that we get used to summer, and these behaviors level out, it will be August and time to go back to school. And that will bring another transition. Fun! After today, I hope the time quickly passes. Don’t be a hater. Don’t remind me of how many wonderful memories can be made over a summer break. I get that; not every moment of our break will be like today. I’ll enjoy those precious moments just as any other mom would, but until you spend a day with my monkeys (when they behave as they do for me, not as they do for everyone else! ), keep your fluffy, sparkly, rainbow-laced comments to yourself. There may be a ban on bubbles around here for awhile, but I’m certain they’ll find some other mischief before the summer ends. The foundation for which I work is hosting a video contest, #WhyWeBuddyWalk, to illustrate the reasons families like mine are inspired to participate in Buddy Walks across the country. Anyway, this can only begin to illustrate #WhyWeBuddyWalk, but I hope you’ll enjoy our video. To donate to Team Alex and the 2014 Columbus Buddy Walk, please visit our team page here. Team Alex, the Buddy Walk team honoring my son, will walk in our 11th Buddy Walk this September. Eleven?!? Doesn’t seem possible, yet here I am, working on my 11th campaign to raise money for the Down Syndrome Association of Central Ohio. Our team’s goal this year is to raise $7500, none of which is specifically earmarked for Alex; rather, all of the funds raised will benefit our entire Down syndrome community, providing valuable programming for individuals with Ds and their families. Last year we started proclaiming the third day of the week as $10 Tuesday. This is a fun and simple way to not only raise money for our team, but also raise awareness for the event and our mission. So, each Tuesday, you’ll see me post to Facebook and Twitter an announcement to remind everyone to visit our Team Alex page to donate $10. Of course, the option to donate more than $10 is always there, and we hope that you’ll even register to walk with us on 9/21 to show your support for Alex and his peers. The event is fantastic; what could be better than a big celebration of inclusion and accomplishments? We also hope that when you see these posts signaling the arrival of another $10 Tuesday, you will be moved to share the posts and help us raise even more awareness of the event (and, ok, raise more money). It’s so easy to share a Facebook post or retweet a statement on Twitter, and those simple acts can really do so much. So here we go, with another $10 Tuesday! Click here to make your donation or join our team. On Facebook? Please click here to “like” our Team Alex page so you can stay up to date with all of our fundraising efforts. On Twitter? Follow me here to stay connected. Thank you for reading today’s post (psst…I’m on a journey to blog every day for a year; I haven’t missed a day yet in 2014! ), and I hope that if you are moved to support Team Alex and DSACO you will click through the links to learn more. If you are interested in getting involved with our fundraising efforts, please don’t hesitate to contact me. Beautiful weather. Good food. Great friends. Quiet reflection and appreciation for the sacrifices made by our military personnel and their families. All of these things made for a lovely Memorial Day. For the first time since 1/1/14, I almost forgot to post. We had another busy day, and Andrew is refusing to go to bed, so I would guess that blogging is just not high on my mental to-do list. I’ll get my thoughts organized and (hopefully!) come back with a substantial post soon. Busy day! Baseball, dance, ice cream, shopping. Very tired. As of 1:30pm today, all three kids began their summer break. Once again, I amazed myself by squeezing in a whole day of errands into two hours. I popped into the kids’ school to spend a bit of time at their class parties, then we took off to check off some items on my To-Do list. Mission accomplished. I am desperate to get my house in order this weekend, so we can get on a summertime chore schedule and not waste all kinds of time playing catch up with housework. It will take a small miracle to get this place in shape, so wish me luck there. I’m not a runner. I don’t enjoy running. What possessed me to register for the Down Syndrome 5K? No idea. But, after thinking about it, I realized that I ask Alex to do things that are difficult for him all the time. He often doesn’t get a choice; he has to try. If I make him do all these things and expect that he’ll try, then I should be open to doing the same. Plus, participating in an event which raises money for the Down Syndrome Association of Central Ohio is always appealing. Tonight’s event was fun, and I’ll plan to return next year. Maybe I’ll even train for it. We’ll see how much pain I’m in tomorrow before I start making grand plans, though. Being the last week of school, I’ve been busy gathering gifts for all the teachers, aides, and support staff that help my kids at their schools. 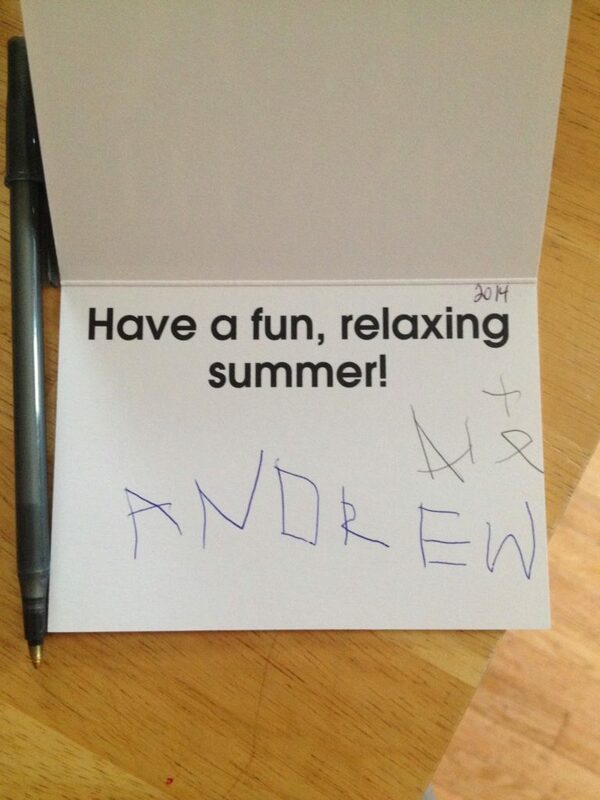 Andrew’s last day of preschool was today, so I had him sign the cards for his teachers last night. Alex threw a fit, because he wanted to sign the cards, too. I tried to explain to him that he would sign the cards for his teachers, but not Andrew’s. He was not a happy camper. Andrew signed his name, I put the cards away, and we moved on. At least, I thought we did. There’s an extra name on this card! Alex, my ever determined little stinker, apparently waited until I was busy with something else last night and then went back and added his name to Andrew’s cards. You’ve got to give him credit for not giving up, I suppose. I’m sure that Andrew’s teachers got a kick out of seeing Al’s signature on their cards, as they were his teachers several years ago. What a long way he’s come since those days!